Mikhail Khodorkovsky has been released from jail following a pardon from Russian President Vladimir Putin, his lawyers say. Vladimir Putin signed a decree earlier pardoning former oil tycoon Mikhail Khodorkovsky on the basis of “the principles of humanity”. He said on Thursday that Mikhail Khodorkovsky, 50, had asked him for clemency because his mother was ill.
Mikhail Khodorkovsky – in custody for a decade – was jailed for tax evasion and theft after funding opposition parties. The pardon comes after Russian MPs backed a wide-ranging amnesty for at least 20,000 prisoners. Analysts say Vladimir Putin may be trying to ease international criticism of Russia’s human rights record ahead of February’s Winter Olympics in Sochi. A document published by the Kremlin on Friday said the decree would come into force from the day of its signing. Mikhail Khodorkovsky’s lawyer Vadim Klyuvgant said prison officials had confirmed that had left the he penal colony where he was being held in the Karelia region of north-western Russia. The former tycoon had eaten lunch at the prison in Segezha as normal on Friday while his release papers were being drawn up, Russian news website Lenta.ru reports quoted an official as saying. 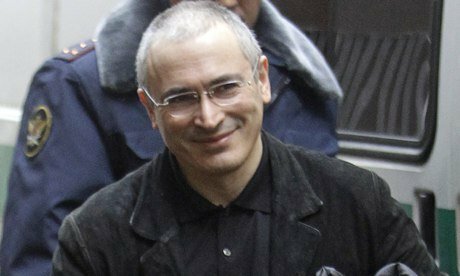 Mikhail Khodorkovsky was jailed after being convicted of stealing oil and laundering money in 2010. He had been in prison since 2003 when he was arrested and later convicted on charges of tax evasion. He was due to be released in August 2014.